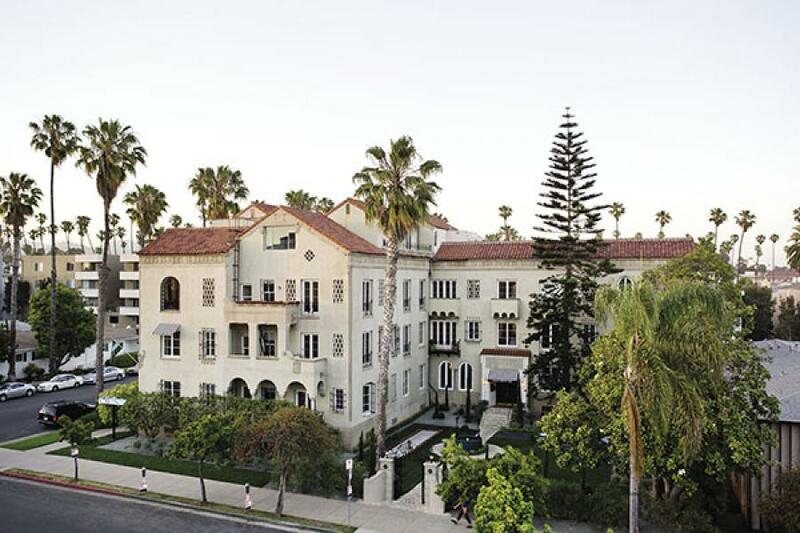 “This is nothing like California,” I overheard one of the staff members say to a guest at Palihouse, the Spanish Colonial Revival mansion-turned-boutique beach hotel that opened last year in Santa Monica in the US. By California, I assume he meant modern, glass-clad, bright and filled with celebrities looking to be recognised. It certainly isn’t that. Instead, this version of Palihouse, as opposed to its more urban sibling in West Hollywood, harks back to an older version of LA glamour, with its 1927 Mediterranean architecture, wrought-iron grillwork, terra-cotta tiles, dark teal and forest green walls, wing chairs and velvet couches. You’d almost expect to see Humphrey Bogart having a smoke in the corner. At one point, J Paul Getty owned the mansion; at another time, it was the Embassy Hotel Apartments, the reason there is still a sign reading ‘Embassy’ at its Washington and 3rd Street corner, confusing first-time arrivals. During the era of cross-country railroads, it was the hotel at the train’s last stop—with a small effort of imagination, you can still feel the echoes of ambitious actors from the ’40s and ’50s discussing that day’s auditions in the courtyard. The guests checking in these days are an eclectic lot—design-forward hipsters or tech-industry types visiting Silicon Beach, the startup hotspot now booming in Santa Monica, or vacationing families who appreciate Palihouse’s residential feel, which includes retro-style kitchens in most of the rooms (complete with copies of Julia Child’s Mastering the Art of French Cooking). The rooms themselves have a whimsical design. Hand-blocked wallpaper with detailed and often humorous patterns produced by a company called Abnormals Anonymous sets the stage for peach-coloured tufted velour couches or salmon-pink hassocks, chairs in black-and-white stripes or fabrics with drawings of apricots, antlers over beds covered in checked throws, and gold mirrors with duck feet. Rooms vary from spacious—the 1,450-square-foot two-bedroom residence and 1,200-square-foot penthouse—to classic rooms (from $395) at 300–500 square feet. Which explains why some guests in the smaller rooms can often be found, on their phones, in the courtyard or in the lobby in the circular green velvet banquettes or on leather couches, surrounded by mounted deer heads and stenciled wood ceiling beams. An especially good time to turn up in the lobby is between 3 and 6 pm when complimentary treats such as mini strawberry shortcakes, chocolate chip cookies and lemonade are set out for guests. Otherwise, the small café serves various coffees, milkshakes and freshly pressed juice mixtures, but doesn’t have a liquor licence. What it does have is breakfast—items such as huge and intense peach cobbler pancakes—served all day, perfect for jet-lagged guests. And there are a few lunch entrées such as fish tacos and fried chicken sandwiches. Beyond that, the cafés bordering the Santa Monica beach are all nearby. And if you come back late, you have a front-door key to let yourself in, furthering the intimate feeling they want you to have, that you are more of a neighbourhood resident than a guest.